If nothing else, this blog post is to remind you about how much I love pizza. Pizza is the ultimate food to me. Seriously. It satisfies every food craving I really have. Except maybe chocolate. But I’ve been cutting way back on that, except for an every-now-and-again 1 ounce dark chocolate treat. Back to the pizza. Anyway, I have a myriad of gluten free pizza crust mixes that have worked and not worked in the past. I’ve tried just about every gluten-free pizza shell out there. If gluten free pizza is on the menu at a restaurant…you better believe that’s what I’m ordering. Pizza…is perfection to me. Food perfection. It’s my go-to pre-race (half marathon or over) meal, which somehow equals out to the perfect amount of fats, carbs, and protein for me to perform at the top of my game. Trust me, I’ve tested this numerous, countless times. So, imagine my glee when I was on a miniature shopping spree at The Raisin Rack in Columbus, Ohio, and came across the Glutenfreeda Gluten Free Artisan Flatbread and Pizza Crusts in their freezer section. I was beyond elated. Seriously. They come in four flavors, so I knew I was going to take one home with me, it was a matter of narrowing it down to which one. The Glutenfreeda Gluten Free Artisan Flatbread and Pizza Crusts come in Sun-Dried Tomato & Herbs, Roasted Garlic, Original, and Parmesan and Asiago. I love garlic…so I went right for the Roasted Garlic flavor. Now, I had no intention of letting these linger in my freezer for as long as they did. I swear to you. However, that being said, they did. I just had fresh produce and other, older products to work through first. That being said, yesterday was a good day. I guess the Gluten Free Pizza Bites I ate after the soccer match on Saturday got my tastebuds craving more, because both my roommate and I were really wanting pizza. But I can’t just make any pizza, you know. I had some fresh produce that needed to be used, so I thought…Brussels sprouts on a pizza. That could rule. But what to pair it with? Vegan and gluten-free bacon. Perfect. What else? Bar-b-que sauce, of course! Add a bit of sauteed onion and it would definitely be a nice change of pace for a pizza. After all, who does Brussels sprouts on a pizza? And thanks to having the Glutenfreeda Gluten Free Roasted Garlic Artisan Flatbread and Pizza Crust in my freezer…I could indulge in my pizza craving without hassle or going to my grocer’s freezer section for a pre-made one. This one…this one would be all mine. Super easy. I preheated the oven with the pizza stone and took the frozen flatbread out of the freezer, defrosting it a little in the microwave. 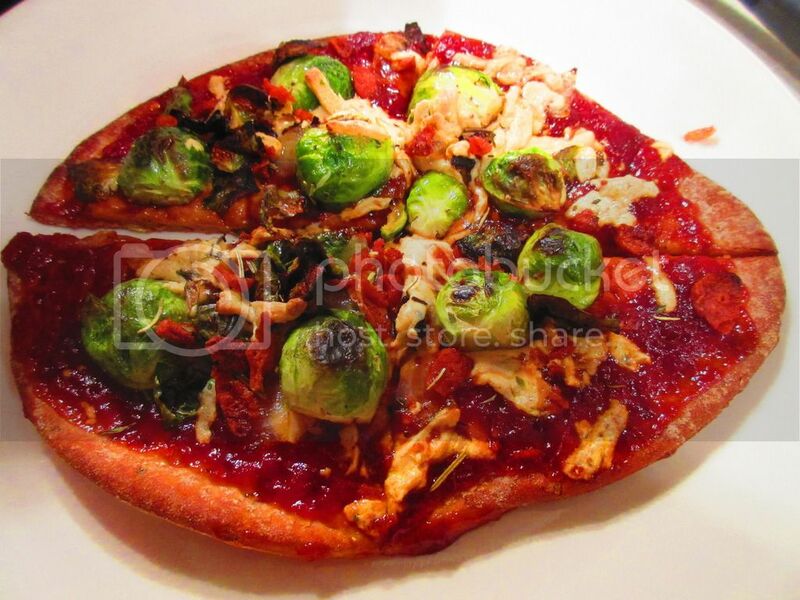 Once the oven and stone were heated, I placed two flatbreads onto the stone and then topped it with some local barbeque sauce, some sauteed onions and Brussels sprouts, the vegan and gluten-free bacon, and then a bit of vegan cheese. Into the oven it went for about 10-12 minutes, to allow the cheese to melt and the flatbread/pizza crust to get that perfect crispness on it (I hoped). Well…it worked. This was, perhaps, the most durable pizza crust that I can buy in a freezer section at the grocery store that I have ever had. Most gluten-free pizzas are thin and fall apart if loaded up with toppings. But because this is also a flatbread, Glutenfreeda has given it some more heft than most gluten-free crusts out on the market. And, even though it was flavored, it didn’t overpower any of the toppings that went on it. The crust toasted up beautifully and sliced into perfect triangles. If using it as a sandwich bread…I’ve heard it can be a little thick for that, but it was perfect for the pizza. And I’m totally looking forward to baking up another round of these tomorrow for dinner. I have more Brussels sprouts, after all. 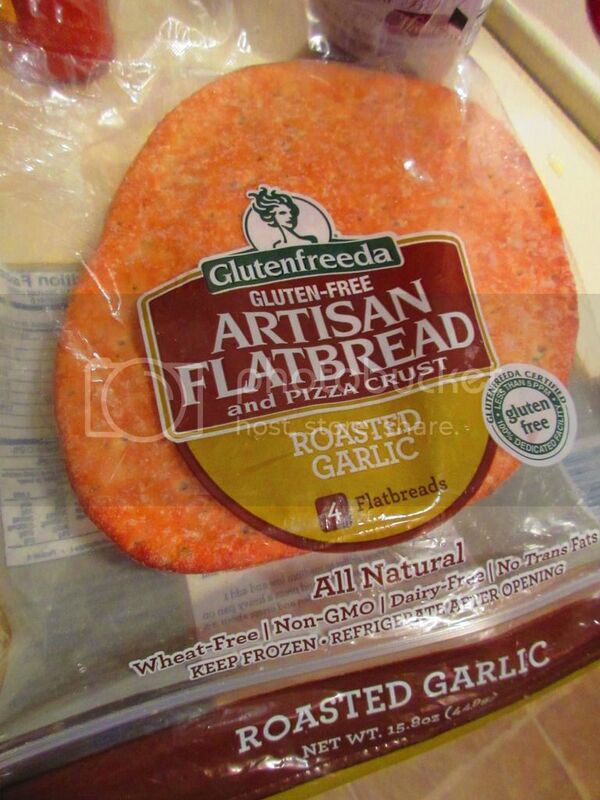 Glutenfreeda really impressed me with their Gluten Free Roasted Garlic Artisan Flatbread and Pizza Crust. Let’s talk ingredients. The Glutenfreeda Gluten Free Roasted Garlic Artisan Flatbread and Pizza Crust is made from water, brown rice flour, tapioca starch, potato starch, expeller pressed canola oil (non-GMO), psyllium powder, egg whites, evaporated cane sugar, yeast, teff flour, seasoning (natural roasted garlic flavor, dehydrated garlic, hydrolyzed soy protein, spices, and salt) flax seed, salt, cultured dextrose, xanthan gum, and citric acid. It is wheat-free, cholesterol free, non-GMO, dairy-free, gluten-free, and contains no trans fats. 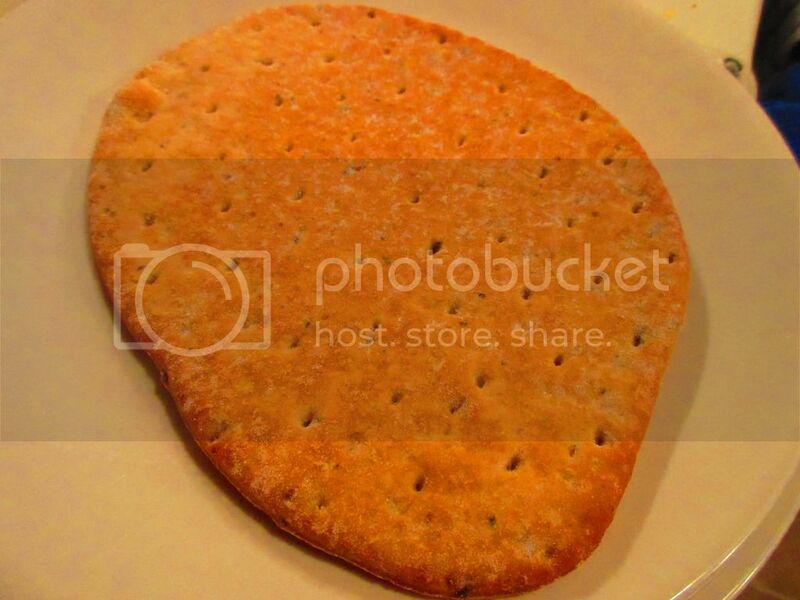 As for nutrition…a serving size is 1/2 of the flat bread. I was using this as my meal, so I ate the entire flatbread. As did my roomie. However, if you stick to the serving size, you will be consuming 110 calories and 3 grams of fat. You will be taking in 380 mg sodium and 0 grams of sugar. Yes…no sugar. LOVE. In addition, you will be consuming 18 grams of carbohydrates, 3 grams of fiber, and 4 grams of protein. This does make for a filling meal…but one that won’t break the calorie bank either as long as you are smart with your toppings. I think, when I can’t pick up a pizza crust from my local gluten-free bakery, I need to find a local store that carries these. Because I was beyond impressed with how it cooked, held up, and tasted. Forget everything you think you know about frozen gluten-free pizza crusts. Pick up a package (there are 4 flatbreads per package) of Glutenfreeda Gluten Free Artisan Flatbread and Pizza Crust (in any flavor…but Roasted Garlic is YUMMY!) and see for yourself. It is amazing. You’ll see! This entry was posted in Baked Goods, Bread, Cheese, Entree, Food, Frozen, Gluten-Free, Italian, Products, Review, Sandwich, Sauce, Vegetables, Vegetarian by The Celiathlete. Bookmark the permalink. I have been eating gluten free for 5 years. Today, I discovered the glutenfreeda flatbread and declared love at first bite! OMG! I don’t have to search any longer for a satisfying pizza crust.